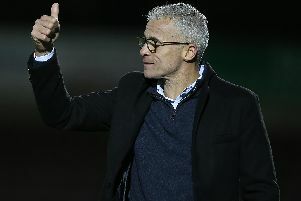 Cobblers boss Keith Curle says it is irrelevant what sort of form Saturday’s opponents Yeovil Town are in. The Glovers are in the middle of a woeful run of results, having not won a match in Sky Bet League Two since claiming a 1-0 victory at Carlisle United on October 27 - and they haven’t won a home league game since seeing off Stevenage way back on August 25. Their only win in the past two months has come in the Checkatrade Trophy when they saw off West Ham United Under-21s 4-0, but they did end a run of four defeats in a row with a 0-0 draw against Cambridge United last weekend. Darren Way’s side have won just two of their past 16 matches in all competitions, losing nine of those, and they are just three points above the relegation zone. But their lowly position means nothing to Curle, who will be preparing for the game just as if Town were taking on the league leaders. “Where somebody else is in the table can change very quickly,” said the Cobblers boss. And he added: “Every game is an opportunity to gain points and build momentum, but we prepare exactly the same for every game, in terms of the information we give the players and the detailed planning we do. “There are the observations from the scouting reports, and the intel we get on every opposition is respected and we don’t categorise.